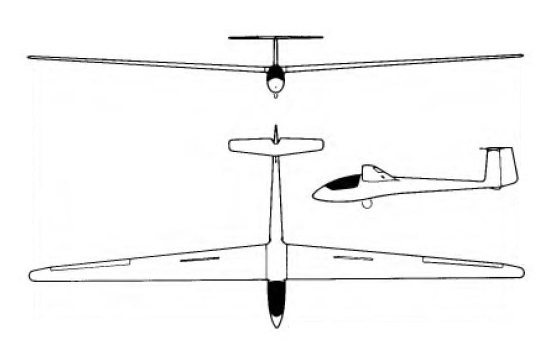 Derived from the Akaflieg Stuttgart FS-24 Phonix, the first sailplane to be built of glassfibre, the Phoebus high-performance single-seater was designed jointly by R. Under, R. Eppler and H.Nagele, the last two of whom had directed design work on the Phonix. The prototype was built by R.Linder and made its first flight on 4 April 1964; it came third in the Standard Class contest in the 1964 German National championships and 8th in the 1965 World Gliding Championships at South Cerney. Production of the Phoebus was undertaken by Bolkow GmbH at Ottobrun, and three versions appeared:the Phoebus A, the initial production Standard Class 15m (49ft 2.5 in) span variant which had a fixed monowheel and tail bumper for landing; the Phoebus B, which appeared in 1967, was the same as the A but with a retractable monowheel, and the Phoebus C was a 17m (55ft 9 in) span version with a retractable monowheel and a tailbraking parachute. The Phoebus was one of the most commercially successful of postwar German sailplanes, a total of 253 having been built when production ended in 1970, and the type did well in contests; at the 1968 World Gliding Championships at Leszno, Poland, Phoebus C pilots took second and sixth places in the Open class and a Phoebus also took third place in the Standard class. The Phoebus, like the Phonix before it, has a basically balsa wood/glassfibre sandwich structure but with a stronger skin. The shoulder wing has air brakes at the 70% chord line and the one-piece all-moving tailplane is mounted on top of the fin to avoid downdraft from the wing. The fuselage is a monocoque structure similar in outline to that of the Phonix, and the pilot is seated under a one-piece canopy, with a control mechanism which is a simplified development of the Phonix's. Compared to the latter, the Phoebus also has better high speed performance and improved gust response.